Two-armed spiral with a pitch angle of 5.56°, showing the solar orbit (eccentricity 0.159). Orion stream stars are shown at a random position on the inward part of the orbit. Stars in with quality index 1 for stream membership are shown in black, stars with quality indices 2 - 4 are have paler grey for a higher index. Image from MNRAS paper. Conventional wisdom suggests that, like planets round the Sun, stars follow approximately circular orbits which cross the spiral arms, and that the Sun presently lies in a spur rather than a major spiral arm. A new study published in Monthly Notices of the Royal Astronomical Society (MNRAS) shows that contrary to this belief, nearly half of nearby stars, including the Sun, have orbits aligned with the Orion arm, one of two major spiral arms. 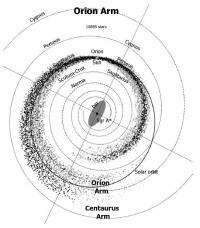 Of the remainder, one third have orbits aligned with the Centaurus arm, and are currently crossing the Orion arm on their way outwards to rejoining the Centaurus arm later in their orbit. Another third have more eccentric orbits straddling both arms. According to this research spiral arms are highways for the stars. Stars join the arms in the furthest part of their orbit from the Galactic centre, attracted by the gravity of the arm. They then follow the arm inwards, picking up speed as they go, analogous to marbles in a marble run. Eventually they pick up so much speed that they break free of the gravity of the arm, cross outwards over the other arm and rejoin their original arm to repeat a similar orbit. The research demonstrates that the Milky Way is a more tightly wound, more extensive, and more regular, two armed spiral than has been thought. The researchers have traced the spiral pattern in the distribution of stars found by the Two Micron All-Sky Survey (2MASS), finding that it extends inwards to about 2.1 kpc from the Galactic centre - the length of the short bar, or "bulge", originally observed by Cosmic Background Explorer satellite (COBE) in the 1990's. This is about half the length of the so called "long bar", seen now as an artefact due to increased star formation in the spiral arms near the ends of the short bar.